18 Ft, 24 Ft, 28 Ft.
32 Ft x 16 Ft, 32 Ft x 18 Ft, 41 Ft x 21 Ft.
Industry-leading Resin Top Rails - More than 10 1/2" wide! Stately elegance, wonderful to touch, obvious in their strength and durability. Gorgeous 12" Vertical Roman Columns - Provides solid, structural support to the top rail clearly making this pool unique in any backyard. 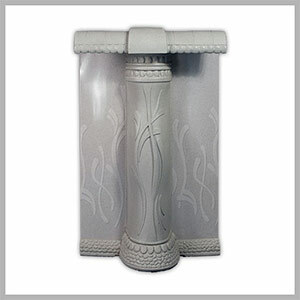 Outstanding 12" Sculpted Top Rails - Granite in appearance, beautiful in your backyard! Made from resin with built-in top connectors. 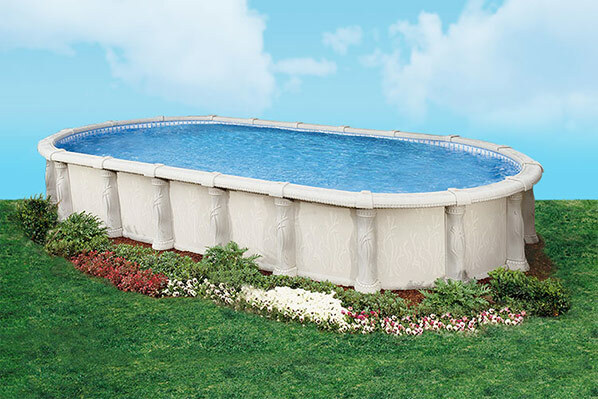 Beautiful 3" Resin Bottom Rails - Fully completes the elegant and unique appeal of this pool. The ingenious design makes the Tuscany easy to assemble with its snap-lock frame. Steel Pool Frame - Our frame steel leads the industry in terms of protective layers, coatings and treatments to provide unmatched protection against corrosion and abrasion. Custom Blended Polyethylene Construction - Provides improved strength, heat deflection and impact resistance. Snap-Lock Type Frame Assembly - Snap-Lock construction is easy to assemble and offers maximum strength with minimal hardware.